You may have heard of Harry’s Bingo, but who exactly is Harry? Well, Harry is the owner of the bingo site! Established in 2008, Harry has been around for a while. Donning industry leading Cozy Games software and being part of the Best Bingo Network, you can rest assured that you are dealing with a quality operation. In fact, other sites that utilize Cozy Games include the likes of Scrummy Bingo and Gone Bingo, both of which we highly recommend. New players receive £15 free when they sign up. The great news about this offer is that no deposit is required in order to claim it. However, you will need to put in card details for the site to fork over the dosh! The free trial cash is great for checking out all the games and learning how to navigate through the site (which is easy by the way!). Details on how to claim your free bingo money can be found here. Once you have claimed your £15 freebie, you will also be eligible for a 400% deposit bonus. Simply deposit £10 and you will get £40 extra free and a total of £50 to play with. Make sure you check out the bonus policy, as well as reading the terms and conditions, which apply to this offer. Harry’s Bingo is a completely mobile friendly site, working on PC, mobile, laptop and tablet. You will be able to access all your favourite games including the likes of 75, 80 and 90 ball bingo. There tends to be a slots promotion each month, so make sure you check that out too, which are again, incredibly fun to play form your mobile phone. You will also find additional daily treats when you login daily. You see, Harry likes to giveaway additional value for his loyal visitors who come back daily. If you keep coming back you will receive extra bonus bucks, bonus and coupon codes, especially for mobile players. Just keep your eyes peeled! Free bingo lovers will be excited to know that free bingo plays out daily on the site. There are daily, weekly and monthly freebies, that said, these freebies are only available for funded players, so make sure you make a deposit to get the most value out of this top online bingo site. One feature we really like are the chat games, where extra free tickets, coupon codes and bonus bucks are given away. When you look at the complete picture, it’s easy to see that Harry’s Bingo is a brilliant bingo site. 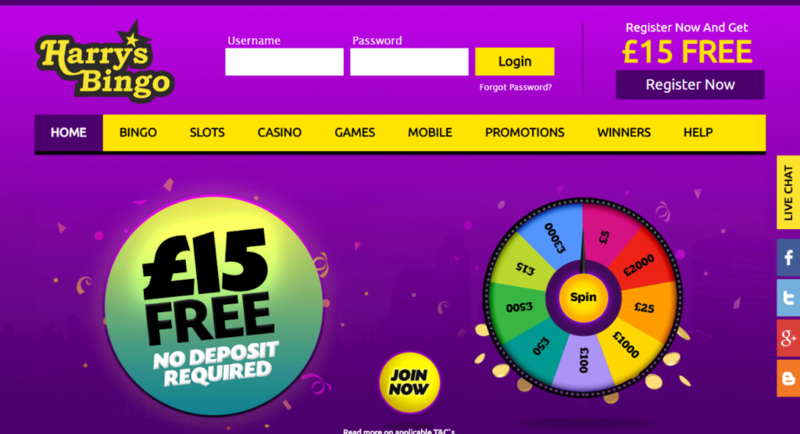 It’s risk free to get started and you will receive a £15 no deposit required bonus on registration. To top it off, you will also get access to a great selection of ongoing promotions, large jackpot games, additional bonus codes and much more. There is a meaty 400% welcome bonus to be claimed too, it really is a top notch offering! So if you are a fan of Cozy Games bingo sites, make sure you visit today and claim your £15 freebie!